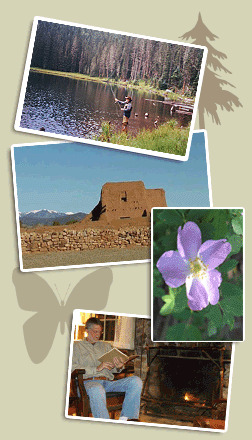 At Los Pinos Ranch, birding, fishing, hiking, horse riding and relaxing are the order of the day. The sparkling waters of the upper Pecos River in the Santa Fe National Forest and its tributaries offer excellent fly-fishing opportunities. The Pecos River runs through the eastern edge of Los Pinos Guest Ranch, the 'trophy' section beginning just downstream from the ranch. Hikers will enjoy the Forest Service marked and maintained trails that can be accessed right at the ranch or from nearby trailheads. Be sure to pack your cameras and field guides for bird and flower identification. Guided horse rides are available for both the beginning and experienced rider. Instruction on trail riding and safety is provided for all riders. 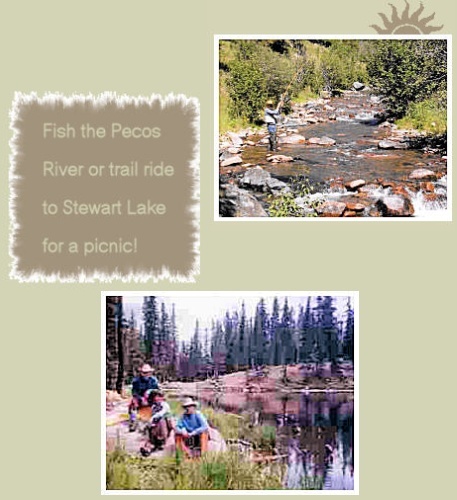 Trails for hiking and riding wind through coniferous forests, aspen groves, and across the spectacular, high mountain meadows of the Pecos Wilderness (in the Santa Fe National Forest). 2017 Newsletter - Read about Birding at Los Pinos Ranch! Bird Watchers enjoy a wide variety of birds. Click for a partial list of birds found at Los Pinos Guest Ranch. For those interested in touring, the historic city of Santa Fe, with its fine museums and galleries can be visited between breakfast and 7pm dinner at the ranch. The Pecos National Historical Park is 25 miles downriver. In addition, other attractions such as pueblos and mountain villages of northern New Mexico offer a variety of sightseeing opportunities. Click for Guided Fishing with High Desert Angler. 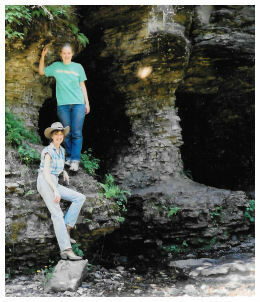 Hike to the caves at Cave Creek. Click for 50th Anniversay Newsletter with Pictures! Click for 2017 Newsletter - Read about Birding at Los Pinos Ranch! Click for 2016 Newsletter - Read about New Mexico's Parks!